Originally published in 1897 as University Geological Survey of Kansas Volume 2. This is, in general, the original text as published. The information has not been updated, and spelling has been kept in the style of the time. An Acrobat PDF version (38 MB) is also available. Map and cross section plates available separately. SIR—I have the honor of submitting to you herewith the following report on the stratigraphy and general geology of western Kansas, including the Upper Permian, the Cretaceous, and the Tertiary. 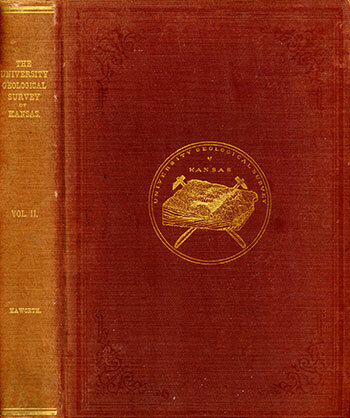 This will constitute volume II of the reports of the University Geological Survey of Kansas. Volume II of the University Geological Survey follows close upon the appearance of volume 1. Those unacquainted with the work already done may wonder how such can be possible when so small an amount of funds has been used by the Survey. It may be stated, therefore, that material for this volume has been accumulating for years, so that it by no means represents the work of the past year only. In the preparation of volume II the writer has been assisted by the following workers, each of whom volunteered his services, and consequently cost the state nothing but his actual expenses: Prof. C. S. Prosser, of Union College, Schenectady, N. Y., with his two assistants, Mr. J. W. Beede, of Topeka, and Mr. C. N. Gould, of Winfield; Mr. W. N. Logan, a graduate of the University, and now principal of public schools, Pleasanton; and Prof. S. W. Williston, professor of palaeontology in the University, and regularly a member of the Survey staff. The state has consequently been greatly benefited by their gratuitous contributions of service. The drawings for the five etchings forming the figures in the text, and all the plates excepting the half-tone reproduction of photographs, were made, excepting figures 12 and 13, by Miss Harriet M. Huntsman, of Lawrence, the same artist who contributed so largely to volume 1. Her work needs no comment. The engraving was all done by Blomgren Bros. & Co., of Chicago, whose work likewise speaks for itself. University of Kansas, November, 1896. In organizing a University Geological Survey of Kansas a full and complete geological survey of the state was contemplated. The work will necessarily have to be done with relative slowness, which may not prove to be a disadvantage. It is expected that it will be done by the members of the University faculty, their advanced students, and other individuals, citizens of the state or otherwise, who are willing to give their time and energies to the state a few months of the year in assisting to carry out investigations interesting and scientific in character, and valuable in many ways in their results, the compensation for which is to be an increase in the knowledge of nature, an opportunity to study geology in the field, a medium of publication by means of which they may have their labors brought before the world, and the consciousness of having added a mite to the "increase and dis semination of knowledge among men." Since the University has opened a graduate department in geology and paleontology it may not be a vain hope that the survey will help to build up these departments and thereby produce a reactionary good in addition to those above named. It is contemplated by the Board of Regents that the interested departments in the University will severally be responsible, not only for the work accomplished under the departments, but for the degree of energy and zeal with which it is prosecuted. Each will therefore be expected to issue reports from time to time on the work done, reports covering greater or lesser subjects, or natural divisions, of the great science of geology. At the outset it was agreed by all that the investigations in general stratigraphy, areal boundaries, and allied subjects should be taken up first, after which. other divisions should follow in natural order. The present volume, Volume II of the series, is prepared principally by the department of physical geology, although the department of paleontology has added a brief description of the paleontology of the Cretaceous and later formations of the state. It is a companion to Volume I and covers the western part of the state similarly to the way Volume I covered the east. It deals principally with the stratigraphic properties of the Cretaceous and younger formations, paying but little attention to the economic phases of the state. A report is now in preparation by this department to the state board of irrigation on work done for them during the past two summers. A plan of cooperation was effected by means of which the department of physical geology of the University combined with the State Board of Irrigation in making investigations in the western part of the state. A large proportion of the data presented in this volume was gathered in that way. This portion of the report of the State Board of Irrigation is practically a report of the University. Other volumes are in preparation. This department has two volumes more than half completed devoted entirely to economic subjects, which will cover the topics of lead and zinc ores, the mining and metallurgy of the same; coal; oil and gas; salt; and gypsum. The report on these subjects will constitute Volumes III and IV. The department of paleontology likewise is preparing a monograph on the vertebrate paleontology of the state which it is hoped will be published during the next two years. Likewise the department of chemistry is preparing a report on the mineral waters of the state which may be expected within a year or two. It should be remembered by the scientific reader that these reports are intended primarily for the masses of the citizens of Kansas, and that therefore an elementary character must be preserved, not however, it is hoped, at the expense of scientific accuracy. Divers elementary explanations must be given, and rudimentary principles, however well known to the scientist, must be elucidated, even to the frequent repetition of long used illustrations. But it is earnestly hoped this will not result in unnecessary repetitions, or in any other ad which may give them a "padded" appearance.